In a year featuring multiple cinematic depictions of Oakland, California (including the flashbacks from Black Panther and the entirety of the upcoming Blindspotting), it’s hard to imagine one as grabby or arresting as the Oakland of Boots Riley’s Sorry To Bother You. Though it uses real locations from the city, Riley’s version depends less on particular landmarks or geography than the filmmaker’s eye for which quotidian details can be nudged into the realm of absurdity—and how to pull them back down to the ground. It’s a push-pull best depicted by the movie’s visualization of a job at a rundown call center: When Cassius Green (Lakeith Stanfield) places a cold call, the movie briefly throws him and his workstation into the personal space of whoever he’s speaking with, sort of a physicalized split-screen that thrusts him back into the bleak office space when the conversation ends. It’s a neat trick that emphasizes both the intrusiveness of cold calling and the discomfort the caller might feel, all while keeping the scenes of call-center drudgery from becoming as dull as the actual work. At first, Cassius is grateful to have the job at all. He’s months behind on rent, and even if he manages to cover it, he’ll still be living in his uncle’s garage. His girlfriend, Detroit (Tessa Thompson), is understanding of his situation, but also of his need to get some money in his pocket, and soon joins him at the call center. Cassius doesn’t make an especially adept telemarketer until an old-timer (Danny Glover) gives him a crucial piece of advice, telling him to talk to customers using his “white voice.” After a surprisingly nuanced discussion of what constitutes a white voice, Cassius finds a workable version of that old stand-up comedy cliché: When he speaks on the phone, he makes himself sound like David Cross. Actually, not just “like.” His white voice really is provided by David Cross, dubbing over Stanfield when the situation calls for it—and as Cassius sees some success at work, the situation calls for it more and more often. Soon, he’s making calls for his firm’s parent company, WorryFree, a manufacturing outfit that cheerily advertises the convenience of a worker contract that provides meals, lodging, and, essentially, a late-capitalism spin on slavery. As Cassius’ fellow telemarketers seek to unionize themselves, he finds himself pulled to a hastily assembled version of the big time, complete with overtures from WorryFree CEO Steve Lift (Armie Hammer). Detroit and the couple’s buddy Salvador (Jermaine Fowler) feel Cassius slipping away from them. 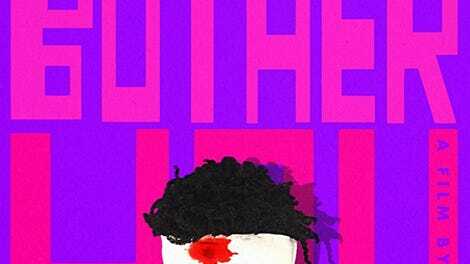 Sorry To Bother You is often wildly funny, and if its broad arc is familiar stuff about a down-on-his-luck everyman experiencing success but at what cost, at least the plot specifics are unpredictable by dint of Riley’s imagination. (No spoilers here, but suffice to say that descriptions of the movie as a “sci-fi comedy” aren’t referring only to its surreal visual sensibility.) In an indie field where so many directors favor kitchen-sink realism, Riley has a sensibility that lands closer to music-video weirdos like Spike Jonze and Michel Gondry—he has more than a foot in the music world as a founding member of hip-hop group The Coup. Like Jonze and Gondry, he also has more on his mind than visual gimmicks. The depictions of telemarketing calls, the gag revealing that Cassius lives in a garage, and the cartoonish contrast between the hell of the call-center floor and the “VIP” area upstairs are clever, but they’re also thematically unified around the idea of shifting spaces—worlds that expand and contract without warning or fairness. Despite the obvious brains behind Riley’s eye, he still loses a degree of precision while pursuing his whims, especially in the editing department. For all of the neat locational transitions the director pulls off (like the montage that includes Cassius upgrading his garage abode to fancier digs), his scene-to-scene stitching can be sloppy. Sometimes, Riley knows how to punctuate a punchline with a sharp cut; elsewhere, he’ll let scenes play out near-interminably, especially when he’s got Armie Hammer on the hook, doing extra-long lines of cocaine and peacocking shamelessly as the ultimate CE-bro. It’s a funny performance that’s also perhaps slightly less hilarious than the movie seems to think. But this instinct to let sequences play out becomes more understandable whenever Riley makes a left turn into an inspired idea, which happens regularly. During an overlong party sequence, he uncorks a brilliant scene where Lift pressures Cassius to rap, despite a total lack of evidence that he has any interest in or ability to perform this way. In desperation, Cassius winds up repeating a terrible phrase with gusto, whipping the white crowd into a frenzy; it turns out what they were really looking for is an excuse to chant along with some forbidden words, using racism to excuse more racism. It’s as concise and cutting a bit of satire as is likely to appear in a movie this year. 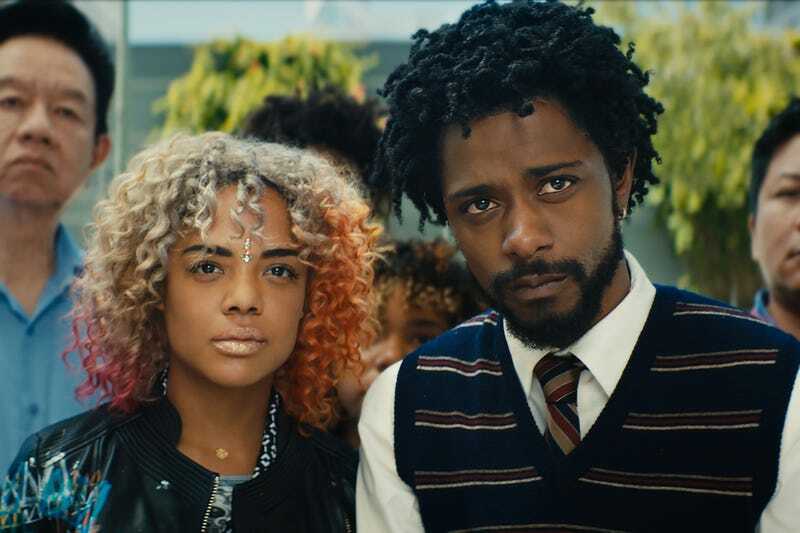 Sorry To Bother You sometimes prioritizes satire over its characters. Thompson has a memorable performance-art scene but for the most part is stuck in a corner as the concerned and ethically upright girlfriend. Really, only Stanfield has a full person to play, conveying a lot through Cassius’ posture, which starts out stooped and skeptical before he finds out how easy it is to abandon his marginalized friends. Even Stanfield’s assured work has some distance to it; how could it not, when so many of his lines are dubbed over? The performance that really matters here is Riley’s. Despite the capable cast and the world they inhabit, Sorry To Bother You sometimes feels like a one-man show, equally impressive and exhausting, and a potent reason to check out whatever he does next.